Lighting is one of the most important rituals when it comes to smoking cigars. Laced with folklore and protocol, the practice can also be confusing to master. However, even if you don’t care much for etiquette, improper lighting can risk undermining your cigar and your enjoyment. Therefore, it’s important to be adequately equipped and aware of the correct technique. If you’re new to cigars or already a seasoned enthusiast, our guides on cigar lighting will help you learn and improve your technique. Furthermore, you can read our recommendations of the best tools for correctly lighting your cigar. Discover The Best Cigar Lighters! In this section of our cigar series, you’ll learn everything that you need to know about lighting. Our easy guides will provide you comprehensive detail while cutting through the mysteries that often shroud the subject. Finally, we also offer our own recommendations of the best tools at your disposal with our definitive guides. Use the menu above to navigate between our lighting guides! All your questions answered. With our definitive guides, you'll no longer wonder how to light your cigars! Cigar Lighting Guides Reviewed by Charles-Philippe Bowles on January 8th . What Should You Use To Light A Cigar? You’ve likely heard many different do’s and don’ts when it comes to lighting a cigar. A particular subject that is often highlighted and scrutinised is what to use to create the flame. After all, humankind paved the road to civilisation by mastering the art of making fire. Like our ancestors, we should ensure that we have the proper tools for creating a healthy flame! Firstly, it’s important to remember that combustion of any type is a chemical reaction. Different fuels contain various by-products used to stabilising or storing them. Whilst some of these are odourless, others are not. For instance, liquid petroleum gas (LPG) as used in stoves contains traces of hydrogen sulfide and mercaptans. As pure butane and propane are odourless, these are included to create a bad smell if the gas leaks. Therefore, never use a stove to light your cigar! Similarly, cardboard matches and candles feature their own various chemicals that will taint your cigar. Another culprit are and oil-fuelled lighters including Zippos. The fuel for this is based on paraffin, which leaves a strong and unpleasant taste. In a pinch, you could use a Zippo if you let it burn before bringing it to your cigar. Some say that the odour dissipates after a few seconds. However, there’s no guarantee that it won’t affect your cigar’s flavours. 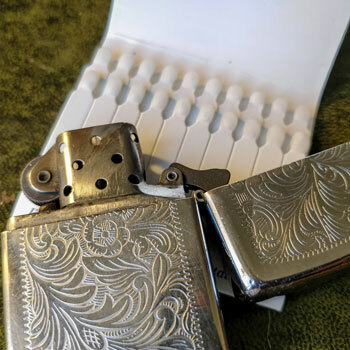 Finally, if you find that you’re not yet equipped with the right lighter, check out our guide to the best ones to buy online! Unlike traditional lighter fluid, butane is a relatively odourless chemical that doesn’t affect the cigar’s flavour. In its natural state, butane is a gas at room temperature. However, lighters store it in a pressurised chamber that renders it liquid. 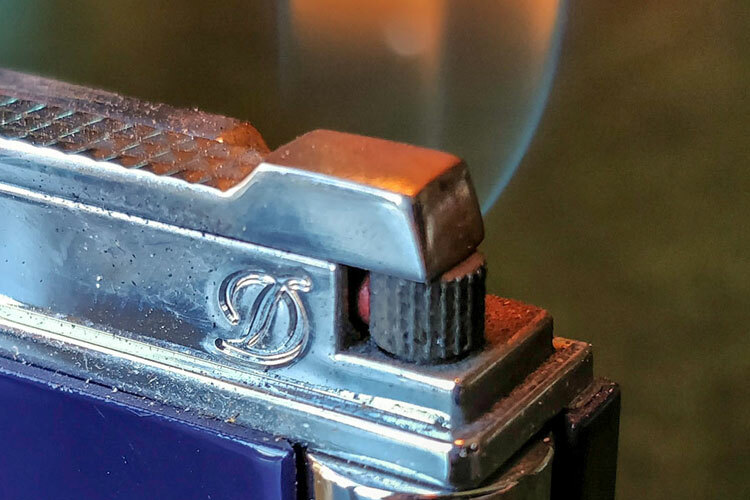 When you press down on a lighter’s button, it releases some of that pressure and the liquid escapes as gas. A spark then ignites the butane at the opening whilst a valve prevents the flame descending into the reservoir. 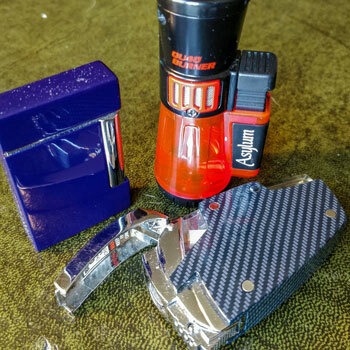 Beyond sharing this same concept, there are many different varieties of butane lighters from disposable BICS to luxury S.T. Duponts. Furthermore, many cigar enthusiasts prefer torch lighters as they create intense and concentrated flames that are easier to master. For instance, a simple disposable lighter will take a long time to ignite a cigar and get quite hot. Meanwhile, a wind resistant multi-headed torch lighter will make quick work of a cigar’s foot. 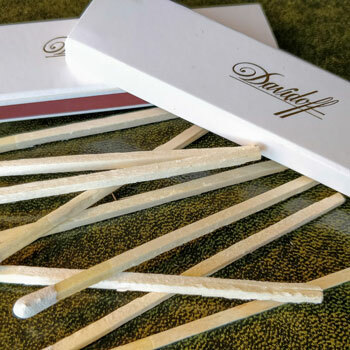 Easy to find and often available for free at cigar retailers and lounges, wooden matches are a perfectly acceptable choice for lighting cigars. In fact, some people prefer the level of control gained by using matches. However, you’ll likely burn through several matches in the process. At the very least, opt for long and thick matches if you can as they will take longer to expire. After all, you don’t want to burn your fingers when concentrating on your cigar. When striking a match, wait until the sulphur has burned away before exposing the cigar to the flame. Otherwise, you may contaminate the cigar’s flavour. One of the most traditional ways of lighting a cigar is with long strips of cedar known as “spills”. They can either be bought are scavenged from the cedar sheets used to separate rows of cigars in boxes. Some experts prefer using cedar spills as they’re perceived as a purer lighting method. Being made from an entirely natural substance, the cigar won’t be affected but sometimes improved by the faint cedar essence. Furthermore, cedar spills are much longer than cigars and tend to burn slightly slower, which means that they’ll last longer. However, they can be messy and leave traces of ash. Now that you have learned about the correct tools for lighting a cigar, learn to light a cigar completely! 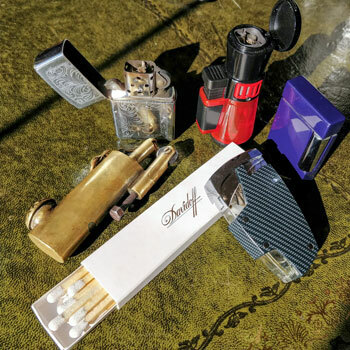 Don’t forget that we also offer a detailed review of the best cigar lighters to buy online!